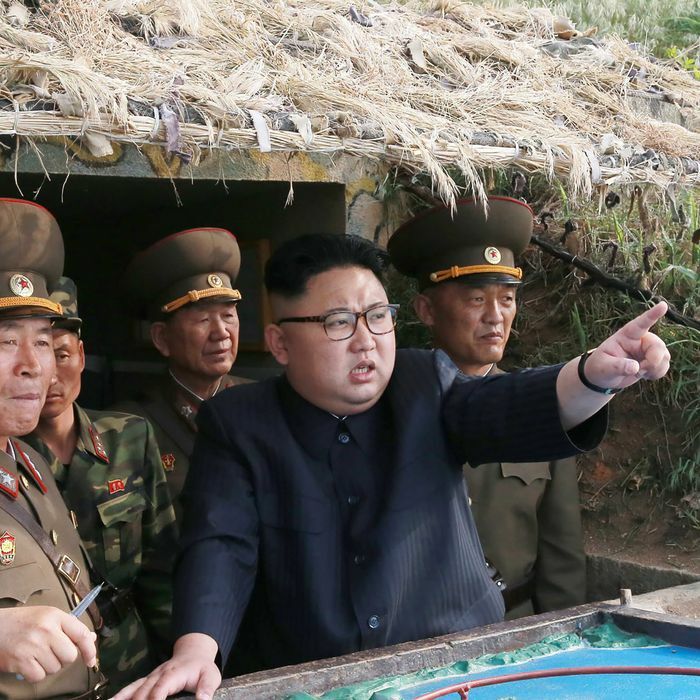 Kim Jong-Un is saber-rattling again. Hours after President Trump threatened “fire and fury like the world has never seen” if North Korea continues provoking the United States, a spokesman for the North Korean army said in a statement that the country was “carefully examining” striking Guam, a U.S. territory, with ballistic missiles. The typically hyperbolic announcement called out the U.S. for “driving the regional situation to an extreme pitch” by staging military maneuvers from Andersen Air Force Base on Guam. The small American territory, with a population of about 163,000, sits about 2,100 miles from North Korea in the Pacific Ocean. North Korea’s rhetoric has grown particularly bellicose since the United Nations slapped the country with harsh sanctions over its nuclear and ballistic-missile program last week. On Monday, the country promised retaliation against the U.S. “thousands of times” over. Trump responded by issuing his difficult-to-enforce ultimatum. On Tuesday, the Washington Post reported that U.S. intelligence agencies believe North Korea can now fit miniature nuclear warheads into missiles, overcoming a major technological hurdle.